Data Warehouse. Data Lake. Data Analytics. Business Intelligence. 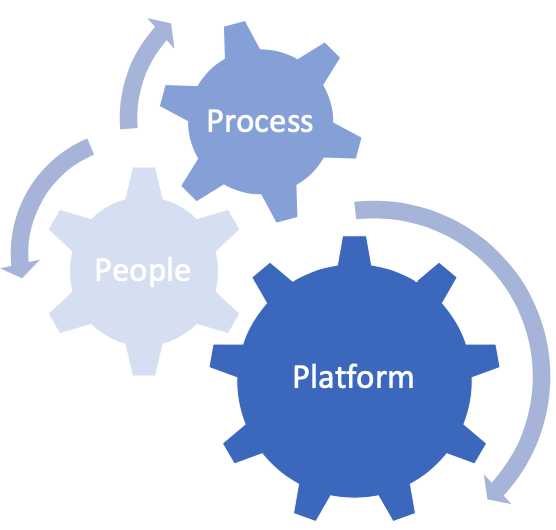 Process or Platform, which comes first? ETL. BI. SaaS. PaaS. OnPremise. MDM. Big Data. One this is for sure, software vendors love their acronyms and jargon. But the golden rule is that data management policies and processes need to drive platform and tool selection, not the other way around. Of course, every software vendor will tell you otherwise, but once they’ve showed you all the bells and whistles on an overhead projector, the real work starts. License Agreements. User Requirements. Hosting Environments. System Integration and Configuration. Data Schema definition. Access Rights Management. Reporting Requirements. User Training. Business Process Change. The list goes on and on. OpsCentre provides a tried and tested methodology to tools and platform selection, developed over 20+ years and more than 50 systems selection and implementation projects. We start be defining clear business, functional and technical requirements, understanding your Enterprise and IT Strategies, defining specific data governance platform requirements and then short-listing vendor solutions to save you the time and effort of scouring the whole market. From there, we can help via attending platform demonstrations, managing proof-of-concept and pilot software implementations and project managing the implementation of final vendor solutions. OpsCentre is always at the forefront of advances in technology platforms and solutions. We provide practical System Selection consultancy assistance to the level you require. OpsCentre is always at the forefront of advances in methods, processes and technology. We provide practical Data Documentation consultancy assistance to the level you require. Healthcheck – Have an existing suite of Data Management documentation, but aren’t sure how it stacks up? We can review and recommend improvements. Is Your Data Documentation in place? Contact Us NOW for a confidential assessment.